Ultimately, it was a lacklustre 25 minute clash, with an already under scrutiny Darren Till claiming a split decision win over Stephen Thompson following a botched weight cut on Saturday morning. Hometown hero Till, stepped onto the scales weighing a massive 174 pounds, until it was revealed his pregnant partner was in hospital suffering complications with her pregnancy. Adding to the growing list of weigh in headaches in 2018, Thompson and his team negotiated a deal that would see the main event go ahead, forcing Till to hand over 30% of his fight purse and upon midday of fight day, had to successfully weigh in no more than 188lbs. So with new terms reached, the main event at the Echo Arena was back on. An almost point fighting, hugely composed display from both men filled the 25 minute period, with ‘Wonderboy’ Thompson’s impeccable footwork and Karate blitz counter striking forcing the heavy handed Till to conserve his energy and carefully throw that clubbing left hand. A shot he landed expertly in the final round, dropping Thompson for a brief moment. A split decision was questionably awarded to Till, with Thompson doing enough to win 3 of the 5 rounds in my opinion. So what’s next for Darren Till? Rafael dos Anjos vs. Colby Covington loser: I certainly don’t believe Darren Till deserves a title tilt just yet, especially with his weight cut fiasco and the controversial nature surrounding his decision victory. In just over two weeks time, a legitimate challenger for Tyron Woodley will be established in Chicago at UFC 225, as former lightweight trail blazer Rafael dos Anjos meets brash trash talker Colby Covington for the interim 170lbs championship. The perfect match up to test Till in my opinion, would see him challenge the loser of the RDA and Covington fight. 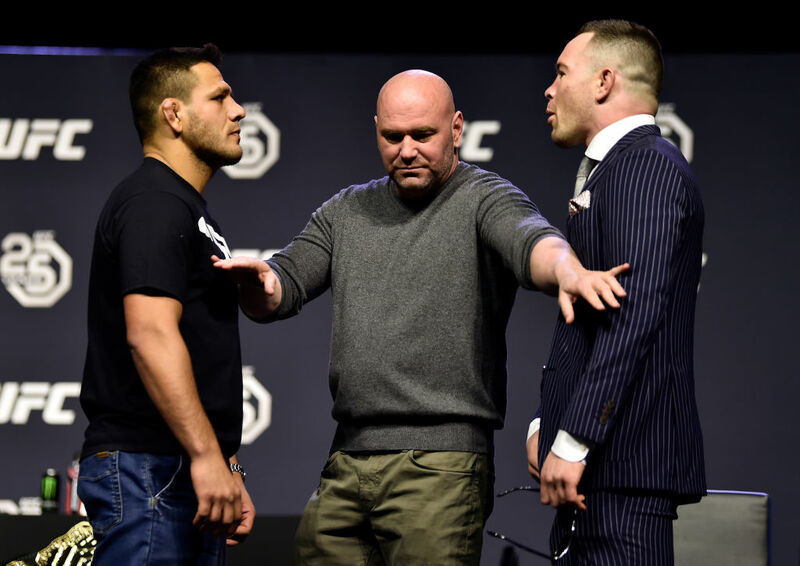 It had be said, “The Gorilla” is yet to be tasked with dealing with a supreme and superior wrestler, something dos Anjos and maybe more so, Amercian Top Team’s Colby Covington represents. I’m currently leaning towards dos Anjos to stop Colby, subsequently taking the interim crown. So why not pit Till versus the loud mouth Oregan State All-American?.. Kamaru Usman: It remains to be seen if Till will leapfrog Stephen Thompson and claim the #1 spot at welterweight. This is particularly due to his failure to make the 170lbs limit, so if he moves a few considerable ranks, face him off against fellow up and coming talent Kamaru Usman. With head honcho Dana White confirming that Till will in fact fight in Vegas in his next trip to the octagon, a PPV spot containing both future champions in my opinion, will further bolster their recognition in a heated welterweight division. Usman is a cerebral wrestler who crept past Demian Maia at UFC Chile recently, but his “safety first” approach replicates champion Tyron Woodley to a certain extent. This would afford Till another opportunity to be tested against a high level wrestler. Robbie Lawler: If this dream matchup gets made and if Till emerged with the win, it almost represents a certain passing of a welterweight torch (even more so than RDA’s demolition of “Ruthless” Robbie). 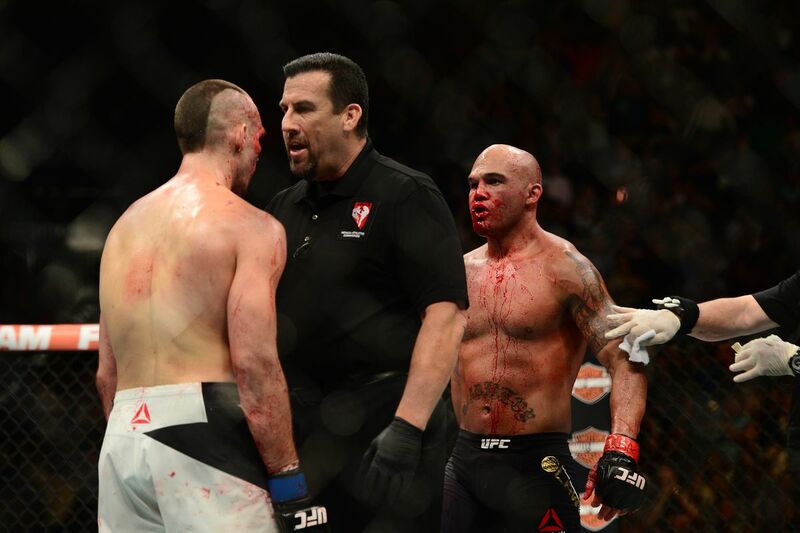 Dos Anjos mauled Lawler unquestionably, ensuring he is seen as a certified elite mixed-martial artist who has reinvigorated his career since his venture up a division. Till is still a huge prospect but a stoppage win in particular over the blood and guts veteran that is Robbie Lawler represents arguably the biggest feather in his cap to date. The UFC’s first trip to Liverpool is in the books and after a closely fought, tactical battle of a main event, local hero Darren Till walked away with the unanimous decision victory. As can be expected when a local fighter wins a close fight in their home town, the MMA community wasted little time in taking to Twitter to share their reactions to both the fight and the decision. Take a look at some of the highlights below. The Wonderboy/Till fight is further evidence that scores should be posted after every round. Fighters deserve to know where they are in the fight. I thought Wonderboy won and it makes me mad that people who DON’T make weight this year are 7-1 in their fights. Something needs to change. On the eve of the pivotal welterweight bout between number one ranked Stephen “Wonderboy” Thompson and number eight ranked Darren “the Gorilla” Till, I reached out to popular Facebook group MMA Freaks, to ask members who they think will be victorious on Sunday evening in Liverpool. It’s worth keeping in mind that the first three opinions below were given before Saturday morning’s weigh in drama unfolded. In case you missed it (and if you did, where have you been?! ), Till weighed in at 174.5lbs and will forfeit 30% of his purse to Thompson. In addition, Till will weigh in again at 1pm on Sunday before the bus leaves for the arena and must be no heavier than 188lbs. Take a look at who the fans have picked and why below and let us know who you think will take the win in the comments. Joey Jacalone – I’m cautiously picking Darren Till. I’m picking Till because as great as Wonderboy is, his style tends to get muted when herded towards the fence. Till, being able to play the role of both the bull and the matador in some fights, I feel can herd Wonderboy towards the fence using feints, which he has shown he is very good at using, and the threat of the left hand. I feel like this will cause many problems for Wonderboy, but I could absolutely be wrong if he can’t get him to the fence. Anoop Nair – I am picking Wonderboy! Till has not faced this level of competition yet and Wonderboy is a genius at maintaining the distance and keeping his opponents at the end of his punching and kicks! Cardio plays a major factor as well! Wonderboy can go 5 rounds easy with the style but Till has already shown tendency to tire after round 2! It’s either Till KO’s Wonderboy within 2 rounds or Wonderboy will school him for 5 rounds! Comparing the talent each man has faced in MMA, there is no comparison. Stephen Thompson has by far faced a higher level of MMA talent than Darren Till. Till’s destruction of Cowboy Cerrone was a great win and a feather in his cap, but we all know that sometimes, ‘ol Cowboy’s head doesn’t make the trip into the Octagon. Besides Cowboy, Till’s UFC wins have been two decisions, a draw, and a TKO – all against middling talent when compared to the talent faced by Thompson. Till supposedly has this demigod-like kickboxing record – something like 44-0. But while one used to be able to find reference to it on Wiki and other sources, since he became a hot commodity in the UFC, that kickboxing record has mysteriously been scrubbed from any record I can find, leading me to think that it was unverified, and once Till became known, UFC handlers made sure that a false kickboxing record was not hanging out there to tarnish their rising star. Experience. Stephen Thompson has gone 10 rounds with Tyron Woodley, has weathered the storm, and was not finished. I am completely open to Darren Till proving me wrong. But with the information we have at our disposal at this moment, there doesn’t seem to be any logical reason to assume he’s going to beat Wonderboy Thompson. Gregory Dorvil (MMAMotion) – In light of recent events, I’m picking Wonderboy to win via TKO. The weigh in complications will likely take their toll on Till, especially facing someone like Wonderboy. Brad Dalrymple (MMAMotion) – I’m picking Till to win by KO in round 1 – I feel with Darren working on his usual forward pressure and distance control he will move quickly inside from the offset, close the distance and catch him early. That extra weight should prove very useful. Even Wonderboy will struggle to keep him at bay. Thanks to MMA Freaks and specifically Joey, Anoop and Paul, Gregory and Brad for taking the time to provide their thoughts on the main event. It’s official. Darren Till will face off with Stephen “Wonderboy” Thompson in the main event at UFC Liverpool on Sunday 27th May at the Echo Arena. Till (16-0-1) campaigned hard for the UFC to bring an event to his home town and after months of calling out the majority of the welterweight division he has finally found a willing opponent in Wonderboy. Number 1 ranked welterweight contender Thompson (14-2-1) hasn’t fought since picking up a unanimous decision victory over Jorge Masvidal at UFC 217 in November 2017. Per BJPenn.coms Chris Taylor, “Wonderboy” has agreed to face Till in the main event set for May 27th. Till has pursued the fight with Thompson in the past, calling him out on several occasions. The two were initially expected to fight on February 24th in London, but Thompson backed out citing a thumb injury he suffered at UFC 217 in a unanimous decision win over Jorge Masvidal in November. For Till, his last fight was a fantastic showing in which he dominated and stopped long time UFC veteran Donald “Cowboy” Cerrone in the very first round. While the UFC has yet to officially confirm, if this fight takes place it is sure to be an exciting display of high-level striking. Who takes it?